The Crown C Ranch offers luxurious accommodations for up to 18 people. 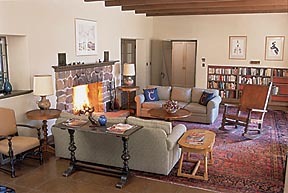 The main house was built more more than 60 years ago from thick adobe block handcrafted of native soil on the premises. Reserve the entire ranch house and guest house with a total of eight bedrooms and five bathrooms or just one room depending on the size of your party. The main house has a living room with fireplace, dining room, kitchen and pantry, six bedrooms, and four bathrooms. You can reserve the entire house, the north wing (2 bedrooms and 1 bathroom), the south wing (4 bedrooms, 3 bathrooms), or an individual room. The guest house has a living room with fireplace, a dining room, a kitchen, two bedroom, and one bathroom.